Peel, then cut the potatoes roughly into even sized chunks. Place into a pot of salted water and boil for about 6 minutes. Drain into a colander, but no need to run under cold water. Shake the colander back and forth so the potatoes roughen up a little around the edges. Leave to cool. Heat about 200ml of olive oil on medium high heat then add potatoes. Fry until crispy and golden, turning from time to time. Serve straight away with Salsa Brava. Heat olive oil in a pan to medium high, add paprika, chilli flakes and vinegar, stirring until a smooth paste. Stir in the tomato sauce and season to taste. Thin the sauce with a little water if necessary. 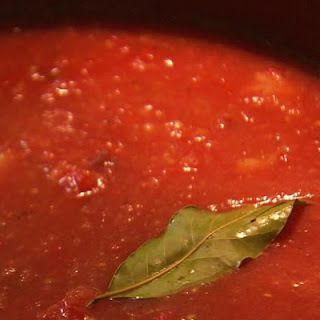 This sauce can be used in so many ways...as a base for other sauces, serve with pasta or rice, as a bed for baked fish or chicken, or even as a pizza sauce...make a big batch and freeze in serving size portions so you always have some on hand! Place olive oil, onions and garlic in a shallow pan and heat on medium high heat for 10 - 12 minutes, stirring from time to time, until lightly golden and soft. Add the tomatoes, water, bay leaves, salt and sugar, stir well and bring to the boil. Lower heat and simmer uncovered for 30 - 45 minutes until reduced and thickened almost to a puree. Remove from heat, take out bay leaves and leave sauce to cool. You can then blend in a food processor if you want a smoother sauce, but this is entirely up to you! Refrigerate for a few days covered, or freeze. 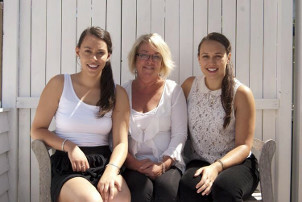 Hello, Kia Ora and Kalimera! As you can imagine there has been a lot of hard work and long hours spent designing and constructing this fabulous online service for you, the customer. 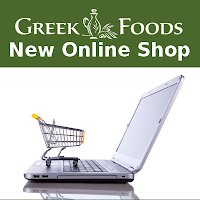 Our aim is so you can browse and shop effortlessly in the comfort of your own surroundings… and have the best quality imported Greek products delivered to your door! We strive to improve, so please let us know your feedback about the website and of course the products. We hope you enjoy your online shopping experience as much as we enjoy sharing our wonderful products. The Greek guy makes these often - lovely as part of a meze platter with tzatziki, or with my Red Roast Pepper sauce. We made hundreds (well it felt like hundreds!) of them for my daughters 21st at her request and served them on large platters with toothpicks and a selection of sauces. Needless to say they disappeared very quickly! Place all ingredients in a medium bowl and mix together with your hands for 3-5 minutes. 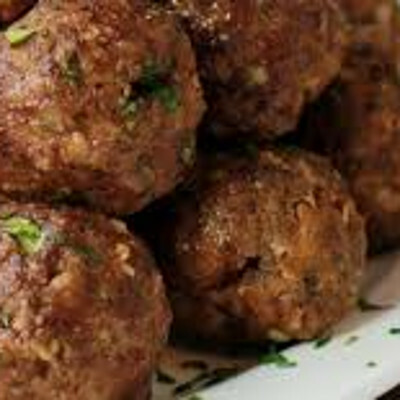 Shape into balls the size of a walnut, put on a plate, cover and refrigerate for at least an hour. The Greek and I are off to Europe this year, staying in Spain first as neither of us have been there, we love exploring new places and we love the cuisine! When we are in Spain I will definitely be buying the authentic Spanish paprika and bringing it back home… and I am sure the flavours will be even more delicious! 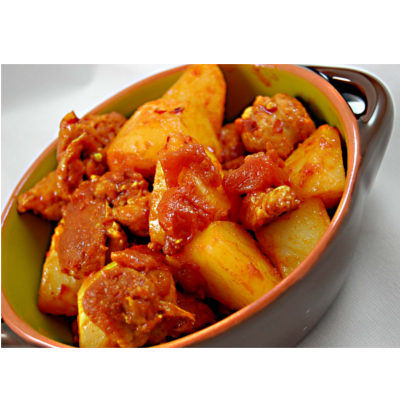 But the following recipe is so easy to make, do try it. Mix herbs, seasonings and garlic in a small bowl, stir in the olive oil and vinegar to make a paste. Rub paste all over the pork cubes, cover and leave to marinate at least an hour - more if you can. 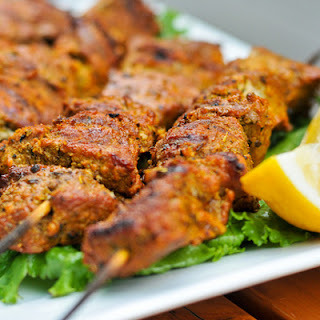 Thread 4 - 6 pieces of pork onto a skewer, so that the pieces just touch. Pre-heat a pan to medium high and lightly oil it. Lay the skewers down and fry, turning from time to time, until the pork is cooked, about 10 minutes in total. Place drained kidney beans in a small pot and cover with cold water. Put to one side. Heat a good splash of olive oil to medium high in a large heavy based pan and brown mince. Once cooked, tip the mince out into a large bowl and set aside. Heat some more olive oil in the same pan and brown the pork, and once cooked, add to the mince. Add the chorizo to the warm pan and fry until browned. Add to the other meat. Heat 1 - 2 tblspns more olive oil in the same pan and fry the onion and garlic until soft. Return all the meat to the pan along with all the juices plus the chocolate, diced tomatoes, stock or water, oregano, chilli flakes, cumin, coriander, cayenne, S & P and vinegar. Stir well, bring to the boil, reduce heat and simmer on low for 1 - 1 1/2 hours stirring occasionally and adding more water if necessary. While the chilli is cooking, place the pot of beans on medium high heat and simmer for 20 minutes. 15 minutes before the chilli is ready, drain the beans and mash them slightly with a wooden spoon then add to chilli, stirring well. Serve with tortillas, fresh coriander, thinly sliced red onion, cucumber, avocado, tomato and feta. Or equally good with corn chips, grated cheese and guacamole! Mix olive oil, harissa, honey, lemon juice, cumin, coriander and paprika. Pour the marinade over the chicken pieces, massage well and leave to marinate for a couple of hours in the fridge. Place marinated chicken pieces in a single layer in a baking dish, season well with salt and ground black pepper, cover with foil and bake in a pre-heated oven @ 200oC for 20 minutes. Remove foil and return to oven to bake for a further 15 - 20 minutes, until chicken has a lovely colour and cooked through. Remove from oven and leave to rest 5 - 10 minutes. Place couscous in a bowl, pour boiling water over, cover and leave to absorb for 10 - 15 minutes. Fluff with a fork. Place spinach leaves, roast red pepper, spring onions and mint leaves in a serving bowl. Add cooled couscous and mix everything gently with your fingers. Just before serving, pour over the dressing, toss lightly, crumble the feta and scatter the almonds on top. Best served at room temperature. Place all ingredients in a screw top jar and shake well until thoroughly mixed. Remove the stems from the chillies, roughly chop the chillies and place in a bowl, cover with boiling water and soak for about an hour. Drain, then place chillies in a small food processor along with the spices, garlic and salt. 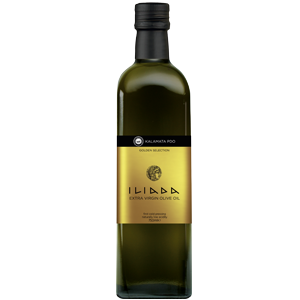 Add a couple of tablespoons of olive oil and process everything for 15 seconds, scrape down the bowl and process again. Add the rest of the olive oil and process until the paste reaches a chunky consistency. Put paste in a sterilised jar, cover with a thin layer of olive oil and store in the fridge for up to 6 months. Melt the butter, cocoa, milk and sugar,stirring in a small saucepan until all combined. Process the biscuits in a food processor until almost breadcrumby, but don't worry if there are a few larger pieces. Place in a bowl with the chopped apricots etc and pour melted mixture in. Mix until combined and press into a cake tin, put in fridge to cool. Ice with chocolate icing, cut into squares and serve. Lasts well refrigerated but it doesn't usually last longer than 2 days before it is all eaten (especially when the Greek guy has never tasted it before and keeps having to have 'one more piece'!!! Nothing could be easier than these pastry scrolls! 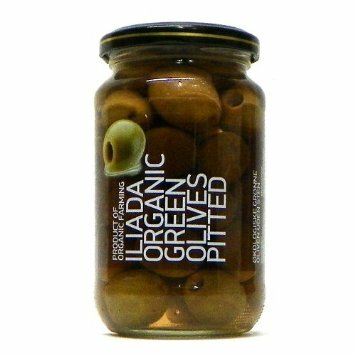 They can be filled with a variety of spreads - Roast Red Pepper Pesto and Green Olive Pesto are just as delicious. If you are making them with pesto, sprinkle a small handful of grated parmesan on top of the pesto before rolling up the pastry. I have made so many of these scrolls over the years, always a firm favourite! Made trays and trays and trays for my girls' 21st birthdays. Take puff pastry out of the freezer and leave to defrost while you prepare the filling. 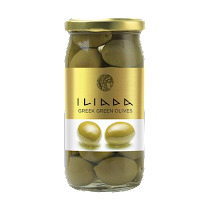 Place the olives, cream cheese and feta in a bowl and mix well. Spread the filling all over the sheets. Roll up the pastry from one side until it comes to the middle, then roll opposite side to meet it, brush with a little water so they stick together. Cut into .5 cm slices and place side down on baking tray. Easily prepared ahead of time - refrigerate until you are ready to put them in the oven. Bake in pre-heated oven @ 200oC for 10 -15 minutes until golden. Serve immediately. Yum!!! Throw everything in a small food processor and process until combined. Store in the fridge for one week, or freeze for up to 3 weeks. I love Sundays when I have plenty of time to make meals that take a little longer to cook. We had a wet Sunday recently so I made the most of it! 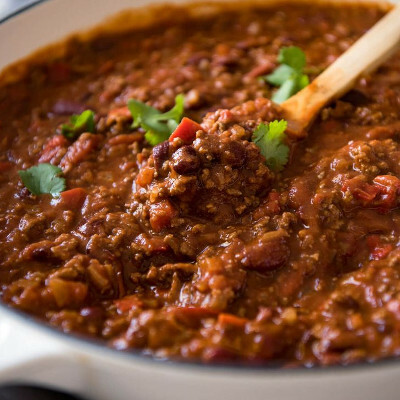 I made this chilli, froze half and had the other half the next night when the flavours had really developed. Then when I have a busy day I can go straight to the freezer and voila - a delicious 'frozen'meal (and not from the supermarket!!!) Nice too in a hollowed out baked potato heated in the oven with lots of cheese on top. Mm mmm and so easy. Heat a good splash of olive oil in a heavy based pan, add the beef, chorizo, chilli flakes, oregano, smoked paprika, cumin and cayenne. Break up mince with a fork, then cook everything until lightly browned. Add all the rest of the ingredients to the pan, plus a tin of water. Mix until combined. Simmer covered on low heat or bake in oven @ 150oC for 1 - 1/12 hours . Stir from time to time and add more water if necessary. Serve with rice, pasta, corn chips and grated cheese, in a wrap or taco shell, whatever you fancy! Nice with a dollop of sour cream, natural yoghurt or guacamole. This is my version of an Italian Panzanella salad - some recipes call for sliced red onion and capsicum also, feel free to add if you want... but I just made it today with the ingredients I had! Dress the salad up to an hour before serving to let all the flavours soak into the bread. Also fab with pieces of left over roast chicken or torn mozzarella pieces mixed through. Cut tomatoes into quarters and place into a salad bowl. Peel the cucumber, cut lengthways, and remove the seeds with a teaspoon. Cut the cucumber into 1 cm slices and add to the tomatoes. Throw in a handful of olives and toss to mix. Heat a small pool of olive oil in a pan on medium high, and while it heats cut the stale bread roughly into 1cm cubes. Toss the cubes in the heated olive oil and fry until golden all over. Leave to cool then scatter them over the tomatoes, cucumber and olives. Scatter with a few basil leaves to serve. Peel and de-seed pumpkin, cut into 1cm cubes, place in a roasting pan and drizzle all over with olive oil and season well with salt and ground black pepper. Toss to coat. Roast @ 180o C for 15 - 20 minutes, or until golden and cooked through. Leave to cool. Meanwhile steam the green beans until cooked to your liking, drain and leave to cool also. Place cooked pumpkin and beans into a serving bowl.Cut the halloumi into fingers and fry in olive oil or coat in flour, egg and breadcrumbs and fry until golden. Arrange cooked halloumi on top of the pumpkin and beans, drizzle with more olive oil and a lovely swirl of the balsamic cream. Another one of the Greek guys recipes - absolute comfort food on a plate! 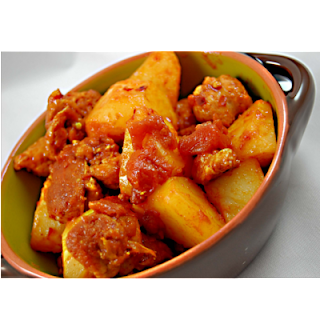 In Greece,a special clay pot called a yiouvetsi is used to make this dish, hence the name. Add the meat and cook over medium heat, turning occasionally, for 8-10 minutes, until lightly browned all over. Add the pureed tomatoes, 1 cup of water, garlic and sugar,season well with salt and lots of pepper. Cover and simmer on low heat for about 1 hour. 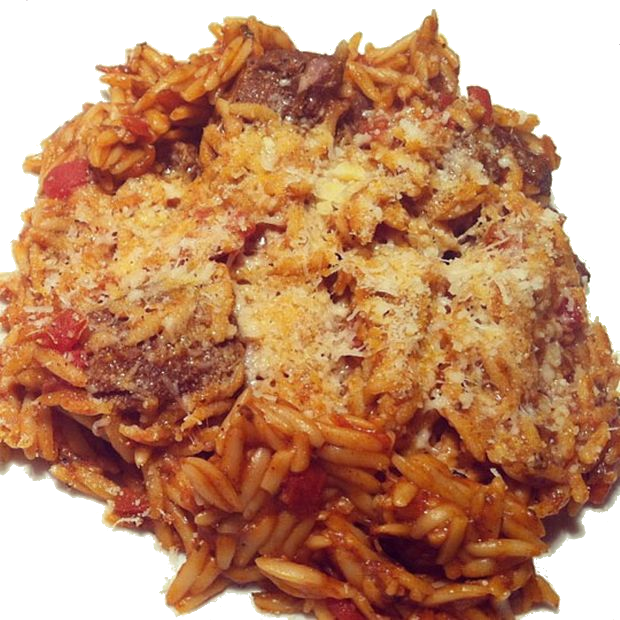 Scatter the uncooked orzo over the base of a large greased ovenproof dish. 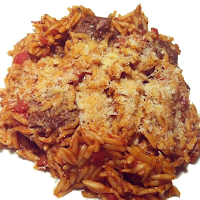 Place the pieces of lamb on top of the orzo. Add 3 cups boiling water to the tomato sauce, mix well and and pour over the lamb and orzo. Cover the dish with tin foil and bake at 180o C for 1 hour. Check from time to time and add more water if necessary if it starts to dry out. In the last 10 minutes of cooking time, remove the tinfoil and sprinkle all over with the grated cheese. Return to the oven and bake, until cheese has melted. The liquid should almost have all been absorbed and the pasta al dente. Serve with a simple salad like maroulasalata. You can also use beef,pork or chicken instead of the lamb. We own a deli shop in Nelson, NZ, selling delicious imported Greek products and I also make spanakopita, baklava and dips for the shop. I will share some authentic Greek recipes the Greek guy has taught me...along with other recipes which use our products! Love to shop online? Well, now you can!